Problems, Problem solutions, criticisms, comments and all matters pertaining to the Problem Department, should be sent directly to the Problem Editor at 106-22 215th Street, Bellaire, L. /., N. Y. For personal replies and the return of unsuitable contributions, inclose a stamped, self-addressed envelope; otherwise replies will be made in the correspondence column. Mr. Otto Wurzburg, until recently Problem Editor of The Chess Review, has found it desirable to relinquish his post. There is, in the opinion of most problem experts, no greater problem composer living at this time than Wurzburg, the "Junior Wizard of Grand Rapids." To lose his services is indeed regretted by this magazine. 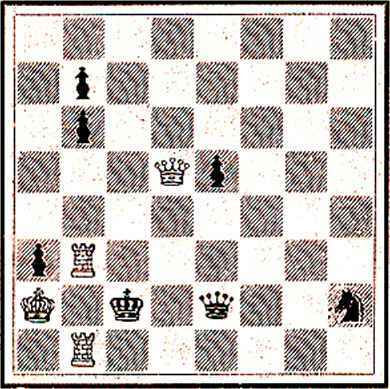 The Chess Review, in tendering its sincerest thanks to Mr. Wurzburg for his past services, is mindful indeed of its loss. I have been summoned to take Wurzburg's place. Years ago, when Mr. Horowitz's plans concerning the editing of a Greater American Chess Publication were still more or less embryonic, I pledged to him, my unwavering assistance, should he ever require it. Though my past experiences as Problem Editor and Tourney Judge arc by no means in the nature of encouragements and though I had solemnly forsworn future activities on those fields, I feel called upon now to fulfill my promise to Mr. Horowitz, that I am in honor bound to do so. Thus, against my inclination, and handicapped by professional duties, I find myself once more at the helm of a Problem Department. Let me breath my heartfelt wish that, this time, my work for the benefit of Problem Chess in America, may prove to be of extended usefulness. 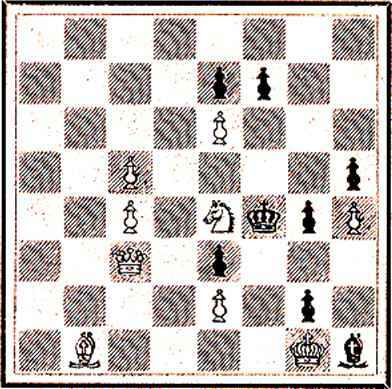 With the liberal and cordial support and co-operation of a steadily growing clientele of Review subscribers I cannot help but succeed; without their aid no chess magazine can outlive its babyhood days. How will I conduct my Department? Precisely as I conducted it in the former Western Chess Magazine. That pattern must have pleased an overwhelming majority, if the numerous letters of approval, and the frequent reprints of my submitted material mean anything at all. I salute you, dear readers, old and new. I am standing loyally by your Editor in Chief, to continue our Chess Review in its accustomed style. Will you stand by me and extend to me the helping hand without which no Editor, be he ever so capable and willing, can accomplish anything worth while. Truly, it is up to you, dear readers. Pressed for time, I continue this Department in the manner of my predecessor. However, in subsequent issues, several changes and improvements arc planned. My aim is to offer something in the Problem Department to every problem lover, from the tyro to the master. We shall have entertaining, newsy and instructive articles, problems of various length and types, a question box, etc., etc. The Solving ladder, with its monthly prize, will be continued. If possible a monthly prize, for the "best"' problem contributed, best according to the vote of the solvers, will be added. ■ Other features are contemplated. Write your suggestions to me. I am at your service—always. H. Burke. 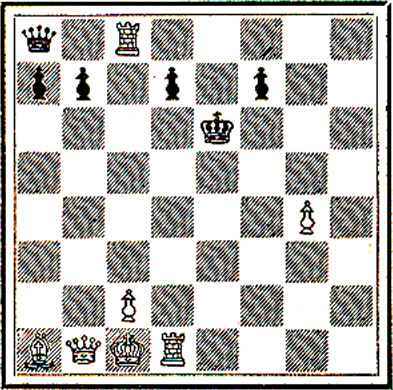 Please send Problem (3er—White King on d7; Black King on c4) as corrected, with full solution. Former copy not to hand. More problems welcome. Walter Jacobs. 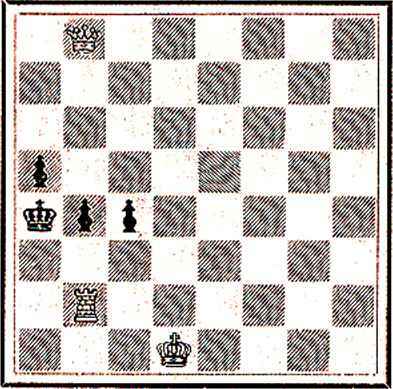 Please send Problem (3er— White King on d4(? ); Black King on al) as corrected, with solution. Former copy not to hand. More problems welcome. Dr. G. Dobbs. Am aware of a mix up regarding your prize. Will be straitened out at once. Sorry indeed, old friend. Sincere greetings. F. A. Hill. Don't deserve your praise ancnt Dr. Mach's gift book. 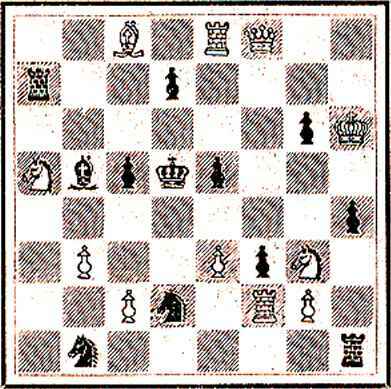 Cylinder mate requires imaginary board where "a" file is attached to "h" file, forming a cylinder and allowing playing all around it. Letter will follow. Send problems. B. R. Cheney. Please send your address. Problems very welcome. Don't care what type. Solvers. Kindly state what type of problems you desire most; 2ers, 3ers, 4ers, self-mates or Fairy problems. A juicy bivalve that opens and closes with precision.—G. Dobbs. An interesting problem.—F. G. Gardner. Beautiful version of this difficult theme,'—E. McCarthy. Beautiful with many close tries.—F. Vail. Interesting.—D. C. McClelland. Nice variations.—Frank Evans. Clean, subtle, neat.—W. Van Winkle. A very pretty problem. —L. Halpern. Rather difficult well planned.— F. G. Gardner. An interesting task.—E. McCarthy. Very clever rook blocks.—F. Vail. Interesting.— D. C. McClelland. An excellent debut.—G. Dobbs. Good for a first effort.-W. Van Winkle. Nice problem.— A. Szabo. A nice sacrifice.—F. G. Gardner. Very fine.—N. Nelson. Very pretty.—F. Vail. Good. — D. C. McClelland. An accurate waiter.—G. Dobbs. Sparkling illustration of pin.—W. Van Winkle. Double pinning well illustrated.—S. J. Benjamin. Not at all easy.—F. G. Gardner. A good though obvious key.—N. Malzberg. Pinning effects. Just fair.— D. C. McClelland. Compliment Mr. Jacobs. Only possible objection is that flight square leads to solution.—F. Evans. Fine Meredith cross checker.—G. Dobbs. Wonderful. —L. Halpern. Excellent.—G. Szabo. Very well hidden.—F. G. Gardner. Novel idea.—E. McCarthy. Ingenious and beautiful.—E. H. Thorne. Very fine.- D. C. McClelland. Easy but not without merit.—G. Dobbs. Amazing. Worthy tribute to the memory of the greatest composer of all times.—W. Van Winkle. Brilliant.—L. Halpern. Excellently arranged.— F. G. Gardner. Good key.—N. Malzberg. Deceiving and finely conceived.—D. C. McClelland. The defense Pb3 is interesting.—G. Dobbs. Sparkling key.—S, J. Benjamin. Neat.—N. Malzberg. Delightful.-D. C. McClelland. Queen sacrifice a surprise.—F. Evans, Queen sacrifice • pleasing.—G. Dobbs. A pretty pure mate. —L. Halpern. Sparkling Queen sacrifice.— S. J. Benjamin. Main variation fine.—F. G. Gardner. A good Queen sacrifice.—E. McCarthy. Quiet catchy key.—Fine Queen sacrifice.—P. L. Rithenberg. Queen sacrifice pretty.—G. W. Hargreaves. Very subtle.—F. Vail. Pleasing Queen sacrifice.—D. C. McClelland. Pretty and neat.—L. Halpern. Some nice play. — F. G. Gardner. Mates pretty but play forceful. —E. McCarthy. Good key with black King has . fine freedom.—N. Malzberg. Bishop sacrifice.— N. Nelson. Excellent.—F. Vail. Mr. Van Winkle evidently one of the talented composers of the day. — D. C. McClelland. In solving Mr. Van Winkle's problem, look for a sacrifice.—D. Morris. The mates are not too obvious.—G. Dobbs. Subtle play.—S. J. Benjamin. Rather easy.—F. G. Gardner. An amusing echo.—E. McCarthy. Pleasing.—N. Malzberg. Teasing.—D. C. McClelland. Almost a perfect chameleon echo.—D. Morris.